Local authorities worldwide are striving to improve their recycling rates, including by co-mingled waste collection. The rates of recycling and waste diversion away from landfill being achieved, have been shown to be much improved by the choice of collection system, and the variety of boxes and bins provided for disposal of the municipal waste generated by every household. In this article we discuss the different types of collection systems which can be adopted. The local authority will supply re-usable containers – or the household is asked to supply one or more containers such as a plastic carrier bag – for the collection of specific materials. This material may be appropriate for bulking and direct sale to a re-processor without further sorting, or some limited mechanical sorting may be used to refine the material quality. The system of single material collections requiring one container for each recyclate type was popular when recycling systems were first introduced and when many local authorities collected only one material, typically paper. However, as recycling schemes have expanded most authorities have chosen to provide a separate collection of a single material where it has not been feasible to add this material to their multi-material collection scheme, for example, glass. 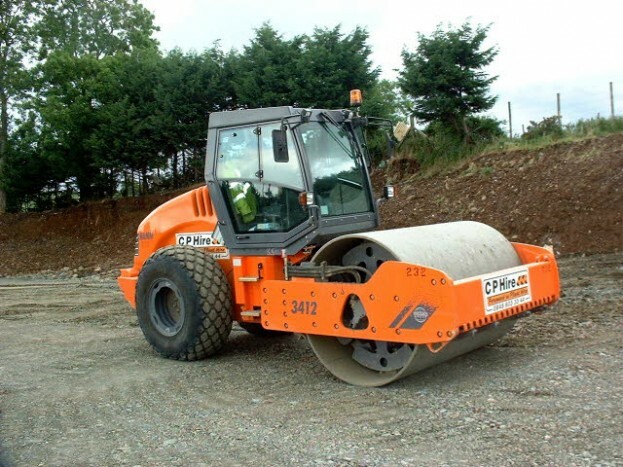 But, for other materials, these are usually mixed in a way that can easily be separated at the kerbside. For example, cans and all plastics are readily sorted by hand, and are often nowadays collected in one container to make it easier for the household to recycle. 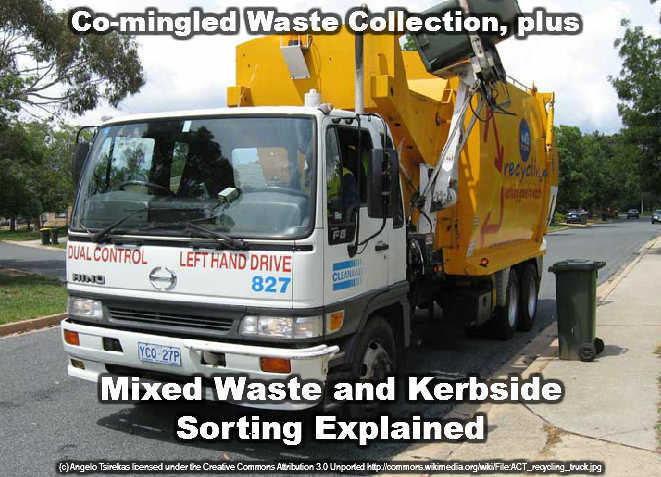 These are called “co-mingled” collections where there is no kerbside sorting. The term co-mingled waste collection means that all recyclable materials targeted by the collection scheme are placed in the same container (box, sack or wheeled bin) by the householder and are collected (co-mingled) in a single compartment vehicle and delivered to a Materials Recovery Facility (MRF) for sorting. Some authorities operate two stream collections whereby households are provided with one or more containers into which specified mixed recyclables are placed for regular collection – either the glass or the paper can be kept separate from the other materials. These materials are collected in two compartment vehicles in order to keep the glass or the paper separate and are delivered to a MRF for sorting In some schemes, households are asked to provide one of their own containers, such as a plastic carrier bag for collection of paper. This type of collection system requires a specialist facility to sort the recyclables into separate material types and to prepare them for sale to re-processors. This is known as a Materials Recovery Facility (MRF) or is sometimes referred to as a Materials Recycling Facility. As with co-mingled collections a container is provided to householders for the targeted recyclables which are then sorted into constituent materials at the kerbside (i.e. from the box outside the household) by the operatives of a specialist collection vehicle. This is a more labour intensive process in terms of the collection operation compared with a co-mingled collection scheme. However, generally a MRF is not required and it has benefits in terms of ensuring that a higher quality of material is usually collected. Recyclables may also be extracted from the mixed MSW (normal residual or ‘black bag’ waste) through separation and treatment processes. These types of systems are described later in this guide and include Mechanical Biological Treatment and Mechanical Heat Treatment. The amount of recyclables extracted from mixed waste collection systems is likely to be limited and of a lower quality (in most instances) than recyclables collected through dedicated source segregated collection systems. However, combined with some form of source segregated collection system, the additional materials recovered from mixed wastes can substantially enhance overall recycling rates. The EU has decided that it wants to encourage high quality recyclates to improve the added value these provide when sold. 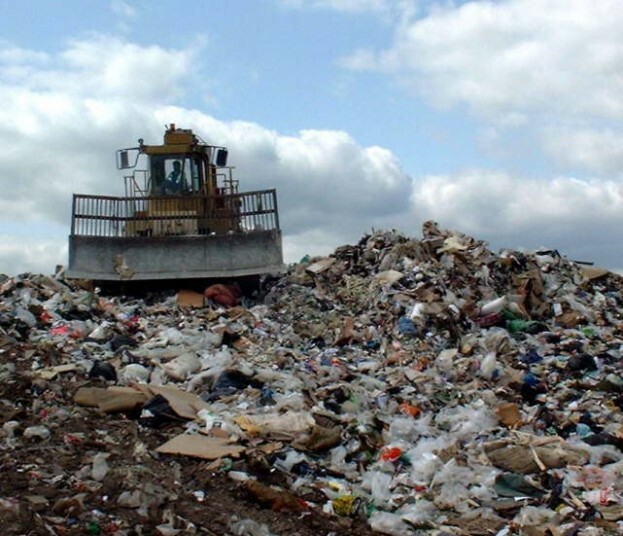 Mixed waste collection is, they consider, inherently inferior as it produces a lower quality/ more cross contaminated recyclate stream than source segregated recyclables. The EU has introduced what are known as the TEEP Regulations which will apply from 2015, which will it hopes predispose the industry to opt for source segregation..